In 2007, Louise Winton wrote and sang the songs, Simpson -The Hero and Great Grandfather’s Bugle as part of her annual ANZAC and Remembrance Commemoration Show, which she gave to audiences in the character of HoneyBun, children’s edu-tainer (educational entertainer). 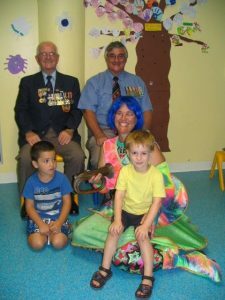 This performance was presented to children all over South East Queensland, supported by the Kedron Wavell RSL Sub-Branch. The show incorporated the sub-branch’s WW1 bugle, historical military uniforms and other military paraphernalia. It was a very special event as it had many past and active members of the armed services in attendance. Children were able to meet them and show their appreciation for their service to the country. Although the character HoneyBun, is no longer performing, Louise is regularly the invited soloist at ANZAC commemoration services in and around South East Queensland, where she sings the Australian and New Zealand national anthems, and both of her compositions. These two songs have now been embraced by the OAM presentation events. In 2016 she sang Great Grandfather’s Bugle for Her Majesty, Queen Elizabeth’s 90th birthday celebration for the Acting Governor General, Paul de Jersey. As a student, Louise took singing lessons at the Queensland Conservatorium of Music, where she learnt opera and the many other music styles. For more than 30 years, her singing has been warmly welcomed by music appreciating audiences all over Queensland and overseas. Louise has performed in lead roles in many of her favourite musicals, such as Oliver, Fiddler on the Roof and Les Miserables with theatre companies from Brisbane to Townsville, including Brisbane Arts Theatre, Ignations, Queensland Musical Theatre and Townsville Musical Theatre Society. She has also spent time in the pub and club circuit. For many years, as HoneyBun, a popular children’s edu-tainer, Louise presented 13 shows to young children to enrich their experiences of the Queensland curriculum. HoneyBun successfully toured the state for almost 15 years from 1998. Today she runs a new business that encompasses her 35 year career in entertainment. She has developed a costumed two act show that combines songs from stage, screen and the classics. This is performed in people’s lounge rooms and in more traditional venues. Occasions where this unique performance has been enjoyed include housewarming parties, a hen’s high tea, moving on parties and cocktails. The show has also been the focal point of a successful fundraising event. As the Lutheran Ladies Fellowship said, they have earned as much from of her concert, as they would have “selling raffle tickets out the front of IGA for 2 1/2 days”. Click ‘Simpson the Hero’ or ‘Great Grandfather’s Bugle‘ to see and hear on YouTube.